Judith McMonigle Flynn – Amateur Sleuth and owner of a small bed & Breakfst. Renie – Judith’s cousin and sidekick. She has a strong apetite. A woman Judith, who is an amateur sleuth, and her cousin Renie, are housesitting for relatives when a body is found on the beach. The two sleuths are determined to find out who killed the man and why. I’m normally a big fan of cozy mysteries. I’ve read everything from Agatha Christie to more modern writers. I wanted to like this one as well, it seemed right up my alley. From the start though, the character of Judith just seemed to rub me the wrong way. She seemed rather harsh and abusive to her husband. She also seemed very caustic with her mother, who also came across as rather mean spirited. Her cousin Renie however I found to be very likeable and a good comic foil for the more serious Judith. Renie reminded me of the character Chet from the Hardy Boys books of my childhood. She had a great passion for food, and was often found stuffing her mouth with some delicacy or other. However, I worked my way past these issues I had, and began to like the character of Judith. I also began to like the story, and the mystery kept me deeply involved in trying to figure out who done it. All the minor characters, suspects, etc. were interesting. The plot made sense, but then that’s where my biggest issue with the novel came into place. In the field of mystery writing, particularly in cozies, there are certain rules about fair play, in that you give the reader all the clues they need to solve the mystery. In this case, that didn’t seem to occur, and the killer just popped up and confessed, without even the two sleuths discovering the identity until the confession. That to me took me out of the story, and just made me feel like I’d wasted my time. Now do I think it was a terrible book. No, I think other Cozie mystery readers would probably enjoy it. There were parts I enjoyed, the ending just left me a little deflated. I myself might enjoy the other entries in the series. I mean this is the 29th book in the Bed & Breakfast Mystery Series, so the author has to know what she’s doing. So I’ll be willing to give her novels a second chance. Perhaps this one was a fluke occurrence. The author does include some recipes in the back for some of the food items mentioned in the story, which is a nice touch in this type of series. In this case it’s Auntie Vance’s Beef Noodle Bake. Regardless, of my opinion though, you the reader may enjoy this story. 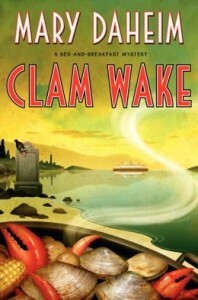 So grab a copy of Clam Wake, settle back, and when you are done, drop back in and let us know what you thought. Seattle native Mary Richardson Daheim lives three miles from the house where she was raised. From her dining nook she can see the maple tree in front of her childhood home. Mary isn’t one for change when it comes to geography. 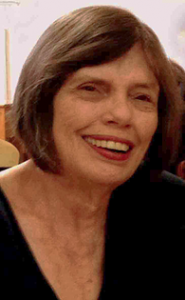 Upon getting her journalism degree from the University of Washington (she can see the campus from the dining nook, too), she went to work for a newspaper in Anacortes WA. Then, after her marriage to David Daheim, his first college teaching post was in Port Angeles where she became a reporter for the local daily. Both tours of small-town duty gave her the background for the Alpine/Emma Lord series. Mary spent much of her non-fiction career in public relations (some would say PR is fiction, too). But ever since she learned how to read and write, Mary wanted to tell stories that could be put between book covers (e-readers were far into the future and if she hadn’t seen her daughter’s iPad, she might not know they exist). Thus, she began her publishing career with the first of seven historical romances before switching to mysteries in 1991. If Mary could do the math, she’d know how many books she’s published. Since she can’t, she estimates the total is at least 55. Or something. See below—count ‘em if you can. At the time of her husband and mentor’s death in February 2010, David and Mary had been married for over 43 years. They have three daughters, Barbara, Katherine and Magdalen, and two granddaughters, Maisy and Clara. They all live in Seattle, too. Those apples don’t move far from the tree…literally.